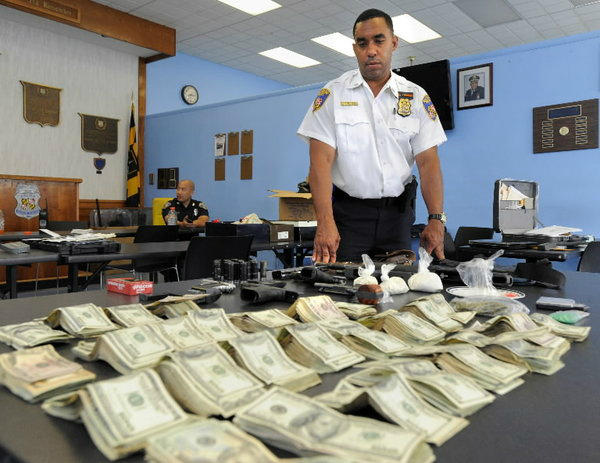 Every year, thousands of people are stopped by American police, only to have their cash seized and never returned to them. Most of these people are never convicted of any crime, and many are never even charged. They are assumed guilty based upon the amount of money they are carrying and are forced to defend the legitimacy of their money in court in order to get it returned. While it is hard to get a full picture of the total sum of money seized (the seizures happen in multiple jurisdictions and levels of policing), several groups have made efforts to make a full accounting of the problem. One such report, by the Washington Post, indicates that American police have made at least 61,998 warrantless stops since 2001, seizing approximately $2.5 billion dollars. 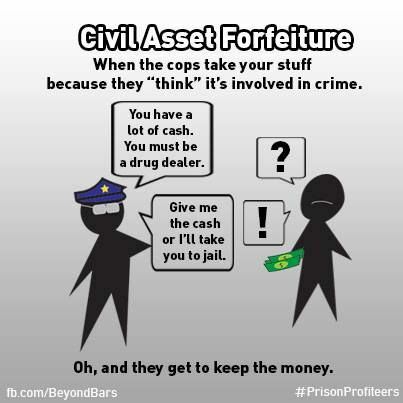 Money that is seized by police is taken under “civil asset forfeiture” laws originally designed to let police seize the property of drug dealers and sell it to fund police activities. 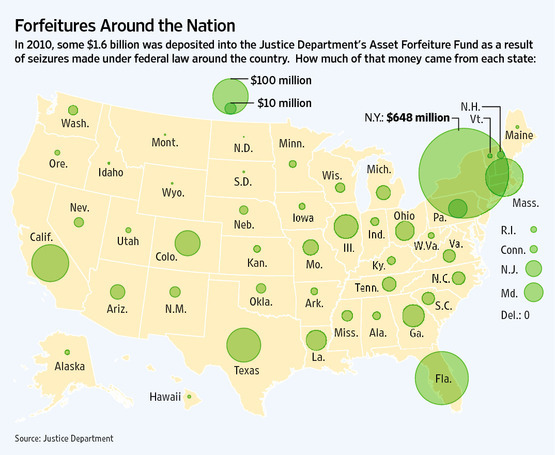 While the specifics of asset forfeiture police vary by state and locale, most let police seize certain types of property (ex. cash, cars used to transport drugs, houses used to store drugs, etc. ), auction it off to the public, and split the profits with district attorney offices, community programs, and the courts. As these seizures are not dependent upon a successful prosecution, there is no need for the police to meet any standard of evidence to justify a seizure (they don’t need enough evidence to sustain a prosecution). Because seizures are not heard in criminal court (in fact, most legal documents list the “defendant” in a seizure to be the piece of property rather than the owner), the state is not required to provide the owner of seized assets with legal representation, and most individuals have to pay for representation out of hand. This lack of free representation to fight seizures makes it so that poor people who have assets seized often simply lack the resources to fight the seizure, thus are forced to accept even the most unfair seizures. Unfortunately, what was once a policy that could theoretically force drug dealers to fund the police has turned into a legal method by which police departments can engage in systematic highway robbery. They lie in wait along highways and pull over cars without probable cause so that they can search them for cash and drugs—whenever they find large sums of cash, they seize it and threaten the driver into accepting the seizure. In some cases the police have threatened to put false charges onto people if they don’t sign over their property. For example, in 2007, the Tenaha, Texas, police pulled over a man named Ron Henderson while he was driving through town with his girlfriend and her two children. The officer claimed that they fit the profile of drug traffickers, and demanded to search the car. He didn’t find drugs, but he arrested them anyways and brought them to the local police station. At the station, the local district attorney made Henderson and his girlfriend choose between giving the police all of their cash and leaving with the children, or fighting the seizure and facing charges for child endangerment and money laundering. Obviously, they took the deal. Regardless of how one looks at this situation, the results are damning—either the police robbed two innocent citizens while threatening their kids, or they took money to let somebody who they suspected of child endangerment go free with the children. In a sane world, they would be forced to choose between guilty pleas of robbery and extortion or accepting bribes and child endangerment. Unfortunately, Nguyen and Henderson are just two of many Americans to be mugged or carjacked by the people we should be able to rely on to stop such crimes from occurring. …and this map only accounts for federal seizures. If we want people to trust the police and actually respect the law, we must ensure that the police stop these kinds of terrible abuses of power. A badge isn’t a free pass to commit crimes like robbery, extortion, perjury, assault, and unlawful detention. The criminal justice system must be completely severed from the market and any potential profiteering. The sole purposes of the justice system should be justice and protecting the public, not harvesting profits on the backs of the vulnerable. Ignorance on some issues really is bliss-unfortunately, it also prevents people from getting outraged en masse on issues like this insanity.